Herbs smooth, with a colorless, bitter juice, with entire, exstipulate leaves. Flowers regular, mostly centrifugal in inflorescence and convolute in the bud. Calyx per-iistent; corolla withering, its lobes alternate with the stamens. Ovary free, 1-celled with 2, more or less projecting parietal placentae. Fruit a 2-valved, septicidal, ∞-seeded capsule, rarely baccate. Seeds with a minute, straight embryo in the axis of" fleshy albumen. Genera 60, species 450, found in every part of the world. Properties. - An intensely bitter principle called gentiunine pervades the whole order without exception, residing in every part rendering them tonic and febrifugal. 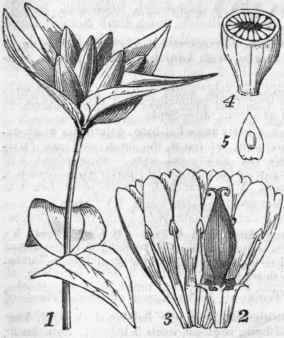 The gentian of the shops is most commonly the product of Gen-tiana lutea, but most other species, and species of other genera, as Limnanthe-mum, Sabbatia, Frasera, etc, are valued in medicine for the same properties, and may be used in its stead. Many are cultivated for ornament. Fig. 664. 1, Gentiana Andrewsii. 2, The calyx and capsule. 3, The corolla laid open, showing the folds (2-lobed) between the proper petals, and the stamens attached at base. 4, Capsule cut across. 5, Seed magnified, with its large, loose testa. 1. SABBA'TIA, Adams. American Centaury. (In honor of Sab-bati, a distinguished Italian botanical author.) Calyx 5 to 12-parted; corolla rotate, limb 5 to 12-parted; stamens 5 to 12; anthers erect, at length recurved, 2-celled, opening by chinks; style 2-parted, slender, deciduous; capsule 1-celled, the valves a little introflexed. - Slender herbs, very beautiful, with pedicellate, mostly roseate fls. All N. American. 2 S. chloroides Ph. St. slender, weak, subterete; lvs. lanceolate, erect; branches few, alternate, 1-flowered; fls. 7 to 12-parted; sep. linear, shorter than the corolla. - Wet grounds, Mass., R. I. to Ga. and Fla. St. 2 to 3f high, somewhat angular. Lvs. 1 to 1 1/2' long, closely sessile, acute, veinless. Fls. solitary, terminal. Cor. nearly 2' diam., much larger than the calyx, bright purple with a yellow base. Jn. 3 S. calycosa Ph. St. erect, terete, fork-branched, rather rigid; lvs. oblong, 3-veined, obtuse; fls. solitary, 5 to 6-parted; cal. leafy lance-oblong, equaling or exceeding the corolla; pet. oblanceolate. - Fields and meadows, Va. to Ga. and La. St. a foot high, subangular, with spreading branches. Lvs. 1 to 2' long, sessile, mostly obtuse, oval, thin. Fls. on long, rigid peduncles, about 1' diam., pink colored. Sep. acute. Fruit as largo as a pea. Jn. - Sept.
5 S. gracilis Salisb. St. slightly angular, internodes twice longer than the leaves; brandies flaccid, 1-flowered, alternate, spreading; lvs. linear and lance-linear, the lowest lance-ovate; panicle diffuse, few-flowered; cal. segments linear-setaceous, about equaling the corolla; cor. 5-parted, lobes elliptic-oblong, obtuse. - Marshes and meadows, Penn. to Fla. and La. Very slender, 1 to 2f high, with long, almost filiform branches. Fls. terminal, subsolitary, 14" broad, on long peduncles. Jl, Aug.
6 S. stellaris Ph. St. somewhat angular, sparingly fork-branched, with long, 1-flowered branches; lvs. lanceolate and obovate-lanceolate, acute; cal. segm. linear, varying in length but much shorter than the 5-parted corolla, the tube top-shaped, very short. - Marshes, Can. to Car. St. 3 to 15' high, often diffusely branched, Lvs. about 1' long, the upper almost linear. Fls. of a bright rose-color, with a yellow star bordered with deep red. Jl. - Sept. S. gracilis (Ell. ), which it closely resembles. 8 S. macrophylla Hook. St. terete, glaucous; internodes twice longer than the leaves; branches opposite; lvs. ovate, acuminate-cuspidate; 5-veined, clasping and subconnate at base, the upper lanceolate; panicle fastigiate; cal. segm. setaceous, shorter than its short tube; cor. segm. 5, elliptic. - In La. (Hale, near Covington). St. 2f high. Lvs. 2' long. Fls. smaller than any here noticed, about 7" broad, white.